South of la Paz, La Ventana Bay is considered one of the best places to practice this sports. A beautiful fishing community, La Ventana is located in the Sea of Cortez only 35 minutes from La Paz, in the State of Baja California. It has a beautiful bay with different beaches where you can practice camping and enjoy full contact with nature. 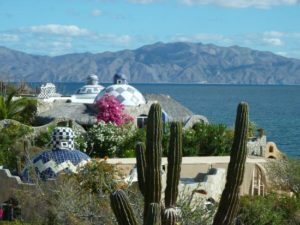 The discovery of La Ventana as a tourist space occurred just fifteen years ago. But with the passage of time, it has also come to consolidate as a great place for kitesurfing. Thanks to the northern winds that hit the side of the beach, especially between the months of November to March. 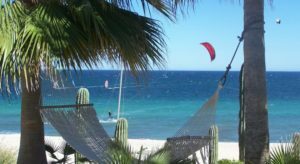 Numerous American and Canadian kiters drive throughout Baja California on their motorhomes, to spend the winter months in La Ventana. But there are many other activities to do in La Ventana, from kayak, scuba, freediving, snorkeling and paddle board. In the same way, its ideal for long walks on the beach, sunbaths and cycling. The waters here are crystal clear and that allows great visibility, which guarantees us to contemplate the rich local biodiversity. At night tourists, many of them backpackers and travel junkies, light up bonfires on the beach. Singing with guitars in hand, admiring the radiant glow of the stars and the peaceful sounds of the calm sea. A perfect beach for romantics, ideal for couples. We advise dining at one of the many local restaurants, where the best specialties of the region are served or if you prefer international cuisine. Many of these places have live music and serve delicious ice cold beer. The atmosphere is lightened, fun and addictive. In the morning it is also an excellent experience to visit the Farmers Market and acquire handcrafts created by locals. If you are planning a road trip thru Baja or Mexico, dont forget to get your Mexican auto insurance from us! Fast and easy to use website. Get your insurance in just minutes. Next story San Luis Gonzaga Bay: A place to relax and drift away in the calmest sea.